Alfie Wood had a relatively short career with Gloucester, initially experiencing difficulty in breaking into the team, and having to change positions from half-back to full-back. But his talent shone through and he won international caps with both Union and League codes of rugby. When compiling his greatest Gloucester team of the previous 40 years in 1930, WB chose A E Wood as the best full-back of that period, and commented that he was “one of the best full-backs of all time”. Alfred Ernest Wood was born on 27th November 1883 in Wolverhampton, the son of a railway engine driver. By 1891, the family had moved to Newton Abbot, Devon, and they remained there in 1901, when Alfie, aged 17, was working as a locomotive engine fitter’s apprentice. Alfie had previously played rugby for Bristol, but transferred to Gloucester for the start of the 1905-06 season, playing in the first game of the season against Clifton at Kingsholm on 23rd September 1905. Before this match kicked off, the new Gymnasium was formally opened – this is the oldest building still standing at Kingsholm, and is now known as the Lions’ Den. Alfie made an immediate impact on the field of play, scoring 3 tries in the 29-0 win over Clifton, followed that up the following week with 2 tries and a conversion in the 17-6 victory over Bristol, and added another try in the fourth match, a 9-3 win at Northampton. 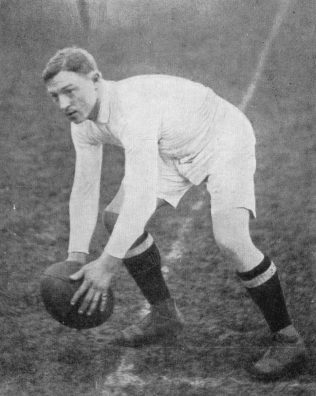 Alfie had to grasp every opportunity he could to play at half-back, where he was competing with Dai Gent, perhaps the most talented player in the side and an England international. Alfie could also play at full-back, but there he was up against George Romans, who had made the position his own for the best part of 10 years, was the Club’s first choice kicker, and had been captain for 4 ½ seasons. Alfie also suffered injury which rendered him unavailable almost as soon as he had made his mark. Nevertheless, the selectors were clearly keen to accommodate him whenever they could, and he went on to appear in 16 matches that season, scoring 7 tries. He also turned out for his one and only game for the “A” team at Swindon on 17th February 1906, when he played at half-back and kicked 3 conversions in a 27-8 win. Fit again for the 1906-07 season, Alfie once more started with a bang, scoring a try in the first match of the season, a 6-0 win over Lydney, and another try and 2 conversions in the second match, a 27-3 win over Clifton. They proved to be his only tries of the season, largely caused by his again finding it difficult to gain a regular place in the side, until the selectors decided that he should replace George Romans at full-back. There was some ill feeling surrounding the replacement of George, a Kingsholm favourite and long-term distinguished servant of the Club. At the end of the season, WB commented that “The season has witnessed the resignation of George Romans at full-back, after long and valuable service to the Club. The circumstances of the veteran’s defection occasioned a good deal of regret, but no useful purpose will be served by re-opening an old wound. All the same it seemed a great pity that Romans’ severance with his old Club should have been attended by any unpleasantness. He was succeeded in the position by A E Wood”. During 1907, Alfie married Rose Clarke in Birmingham. Alfie got the 1907-08 season off to his usual good start, kicking 4 conversions and a penalty in the 38-10 defeat of Clifton in the first match. However, part way through the season, he decided to join Cheltenham. He played his last game for Gloucester on 27th December 1907 against Old Edwardians at Kingsholm – he contributed 3 conversions to the 24-11 win. Alfie had played only 2 ½ seasons for Gloucester, making 48 appearances, and scoring 9 tries, 39 conversions and 4 penalties for a total of 117 points. Despite this relatively short career, he had certainly come to be highly regarded by the Club, which continued to treat him as one of their own. Shortly after his last game for Gloucester, Alfie was selected to play for England against France, Ireland and Wales. WB maintained that “Wood, was a member of the City team when he first received International honours”, even though by then Cheltenham also claimed him as theirs. Alfie’s association with Cheltenham was very brief, because a week after Alfie’s third (and as it turned out, last) Rugby Union International on 15th February 1908, he attended the last of three Rugby League internationals between the touring New Zealand “All Golds” and England, as a spectator. This match was played at the Athletic Ground Cheltenham and was the deciding game, the first at Headingley being lost 6-14 and the second at Stamford Bridge being won by the tourists 18-6. New Zealand won the third match at Cheltenham 8-5 to take the first-ever series. Alfie Wood was recognised at the match and approached by the Oldham committee, and he signed to play for them from the start of the 1908-09 season. However, this immediately rendered him ineligible for the final Rugby Union international of the season. Reporting on the England v Scotland international the following month, The Times said that Lyon the full back in that match was “hardly a substitute for A E Wood, the Gloucestershire man.” The flirtation with Cheltenham, and the impending transfer to the North, seem to have made little difference to Gloucester, and in April 1908, the Club hosted a dinner in honour of their Internationals that season – Hudson and Wood – at which Alfie was duly feted. The 1911 census records Alfie as a professional footballer, living in Oldham with his wife, Rose, and their three young sons; a daughter was born in 1912. Alf Wood (as he was known up North) played for Oldham until 1920-21. He would have felt at home with the club as Oldham played in red and white hoops and their leading player “Mad” Arthur Smith, who played in the Cheltenham international against the “All Golds”, had played Rugby Union for Cinderford. Alf went on to play Rugby League internationals for England (twice) and Great Britain (4 times). Alfie died at Oldham on 15th February 1963, exactly 55 years after his first encounter with Rugby League on the Athletic Ground Cheltenham. Alf Wood left Gloucester RFC to join Cheltenham RFC after he was offered a position as landlord at the Prince of Wales public house in Cheltenham (the pub recently closed in 2015). His appointment was on the condition that he joined the Cheltenham club as a member of the town committee was a high ranking official at the brewery. As mentioned in the above article both clubs did claim him for their own in the following international games, so he was listed in the programme as ‘Gloucestershire’. Another interesting fact about Alf Wood was that he for several years was a professional association footballer with Oldham Athletic AFC as well as playing rugby league for Oldham RLFC. I am a little surprised that there is only passing mention of the famous 1914 ‘Rorke’s Drift’ Test played on the Sydney Cricket Ground between Australia and the touring Northern Union (Great Britain) side. Despite at one point being reduced to 9 men, and playing the last 30 minutes with only 10, the GB side won the game 14-6, and thus the series. Gloucester was well represented by three Oldham players – Alf Wood (who kicked all 4 goals), Billy Hall (of the seven Hall brothers) and Dave Hollands. This website has led to my contact and now regular meeting with Alf’s grandson, Barry from Oldham (Alf was my great uncle) and Barry’s most recent visit to us was for the J P Morgan 7s on 1 August. Since the centenary of the ‘Rorke’s Drift’ Test will be on 4 July next year, Barry and I are considering how this event might best be celebrated. It would be good if some (or indeed all) of the celebrations could be at Kingsholm!! Champagne Anniversary Celebration of the Great Match of February 15th 1908 at the Old Athletic Ground in Cheltenham. From the GRFC match statistics I can see that Alf Wood and my grandfather Ernie Hall played in the same Gloster sides as they both are recorded as try scorers e.g versus Clifton on 29.9.1906. Also a D Hollands is playing at that time and shortly after - he is the third Oldham player in the photo I have. He, Alfie Wood and my grandad’s youngest brother, Billy Hall, represented Great Britain in the ‘Rourkes Drift’ test. They were all ex-Gloucester. My grandfather played for Gloucester from 1904-1908 and was 1 of 7 Hall brothers who all played for Gloucester. The youngest brother, Billy, went on to play League for Oldham with Alf Wood and they played together for Great Britain’s ‘Lions’ in the famous ‘Rorke’s Drift’ 3rd test at Sydney where they won the ‘Ashes’. I have a photo of Alf, Billy and Dave Holland, the 3 Oldham ‘RD’ players. Thanks for the photo, Patrick, which we’ve now added to this page. I have a photo of Alfie Wood if you are interested. I found this signed photo in the scrapbook of a former captain of ours, Victor Fuller Eberle. He played with Alfie in the Gloucestershire Rugby XV. I am putting together details of the Gloucestershire sides at http://www.cliftonrfchistory.co.uk/statistics/counties/glos.htm There is also a picture of Alfie there in the Glos side that played Devon in 1907.